Give your halloween some more sparkling decoration with an adorable ghost figure holding a small pumpkin for a humorous and charming decoration. Chamilia Sterling Silver Trick or Treat Ghost is rated 5.0 out of 5 by 3. Rated 5 out of 5 by Anonymous from The cutest little ghost since Casper! Honestly I can’t describe how incredibly lovely this Charm is. The little details are really beautiful (the tiny hanging pumpkin is adorable) and it looks beautiful on my bracelet. Rated 5 out of 5 by Anonymous from Great It's very cute. 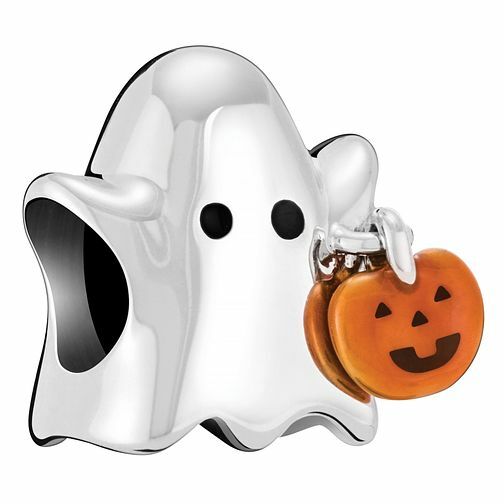 The ghost is small, about 1cm across and 1.2cm height and is the same size as other known charm brands so wouldn't look out of place in terms of size when put with them. It's quite unique due to its shape and size. The ghost has visible ridges underneath and is well-defined like the images. The pumpkin face is clear and visible. It looks particularly nice on leather.